This book provides an account of the development of European culture and society during the Bronze Age, the time span between c. 2000 and 700 BC. It was a period of remarkable innovation, seen for instance in the development and growth of metallurgy as a major industry, the spread of trading contacts, the origins of urbanism and the beginnings of social stratification. The study is divided chronologically into two, the earlier and later Bronze Age, giving a clear picture of the nature of the radical changes which occurred in the period as a whole. The geographical area covered, from the Atlantic shores across Europe into the Soviet Union and from northern Scandinavia to the Mediterranean, is too vast to be taken as one unit, and has been broken down into five regions; each is discussed in terms of settlement form, burial practices, ritual and religious sites, material culture, economic and social background, and trading patterns. The book describes and develops common themes that link together the different areas and cultural groups, rather than taking the typographical approach often adopted by Bronze Age specialists, and uses the results of radiocarbon dating to establish an objective chronology for the period. The text is generously illustrated and fully documented with radiocarbon dating tables and extensive bibliography. 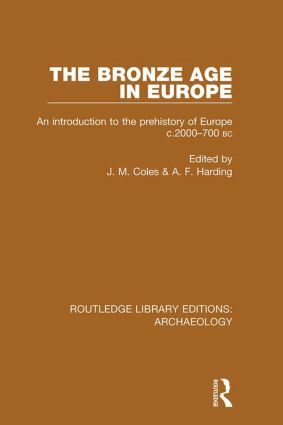 Our understanding of Bronze Age Europe is still increasing, but no other book of this scope had been written before this, in 1979. It is a major study of its time of interest to anyone looking beyond popular accounts of the day.